Anyone who had lived or visited Hong Kong, you will probably know what this is. This is little bowl of fake shark fin soup you can buy from many street hawkers and in some streetfood restaurants all over Hong Kong. The recipe is almost the same as the real McCoy and maybe more msg to pump up the flavour. It’s a cheapie bowl of hot soup so no expensive golden threads of shark fin but cheap and cheerful glass noodles as the substitute. 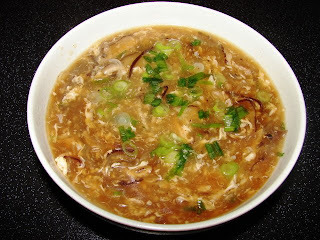 It’s quite a yummy soup with bits of noodles like instant chicken soup with noodles, It's a cross between sweet corn soup and hot & sour soup, without the chilli heat and black vinegar is optional. For a homemade soup I don’t add msg but real chicken or pork stock. Heat the stock or water till boiling, add pork or chicken, woodear and mushroom. Boil for few minutes till boiling. Add seasonings – stock powder or cube, light and dark soy. Add noodles and thicken the soup to a consistency you like. Boil for about 1 minute or till noodles are softened. Wait till the soup is boiling hot, drizzle in the beaten egg and stir at the same time to form egg ribbons. Add pinch of ground pepper, black vinegar and brandy to taste then add some sesame oil and some chopped spring onion (leave some to sprinkle on top of serving bowls). I wouldn't use Knorr cubes or powder if I didn't want to add MSG. That stuff is loaded with it! Think you are right Dave. I've be ignorant reading the label.